Attendees at the semi-annual pro-life summer summit screen and discuss the documentary “Hush” on July 15 at the Archdiocesan Pastoral Center in Philadelphia. 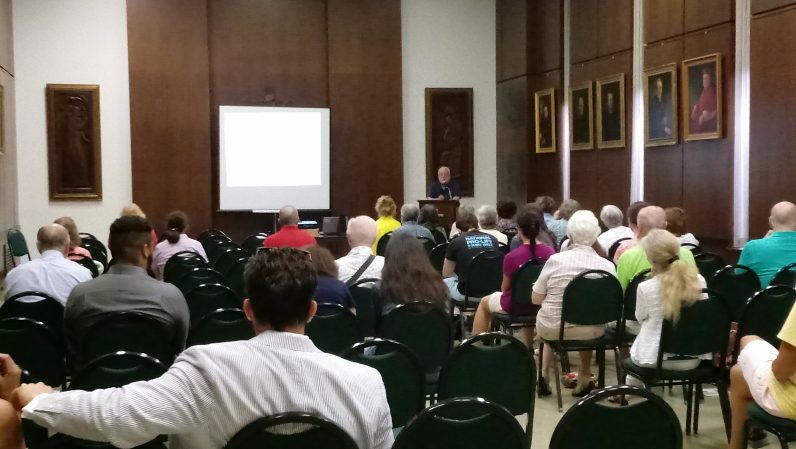 Pro-life supporters from the Philadelphia area met on Saturday, July 15 to discuss the often overlooked impact of abortion on women’s health. The semi-annual pro-life summit began with the recitation of the rosary and Mass in the chapel of the Cathedral Basilica of SS. Peter and Paul. The group of approximately 100 participants then moved to the Archdiocesan Pastoral Center for discussion and reflection. The session featured excerpts from “Hush,” a 2015 documentary that explores women’s breast and reproductive health with respect to abortion. The film represents an unusual collaboration by individuals with opposing stances on abortion. Punam Kumar Gill, a self-described “pro-choice” Canadian filmmaker, directed the piece, which was produced by Drew Martin and Joses Martin, who regard themselves as pro-life and “neutral,” respectively. Gill’s life and health were personally affected by the information she discovered while making the film. Steve Bozza, director of the archdiocese’s Office for Life and Family, shared how one of his students had reacted to the documentary. “She stood up and asked, ‘Why didn’t my doctor tell me about any of this?’” said Bozza, who teaches biomedical ethics and moral theology at Immaculata University. The summit also featured a talk by Dr. Angela Lanfranchi of the Breast Cancer Prevention Institute. Based in New Jersey, the non-profit organization works to reduce the risk of breast cancer through research and education. Lanfranchi, who co-authored “Complications: Abortion’s Impact on Women,” shared her perspective as a physician with over 20 years of clinical experience. Estella Reyes Bugg encouraged the summit’s attendees to spread the word about Project Rachel, the post-abortion counseling ministry in the Archdiocese of Philadelphia, which she coordinates. Attendees at the summit were stirred by the documentary and the discussions. “My hope is women know all of the facts when making their decisions,” said Robert McGowan, a parishioner from Queen of the Universe of Levittown. Crazy Political That Rachel’s Vineyard wasn’t featured. How can you ignore Founder Dr Teresa Burke.based in King of Prussia. Diocese still dislikes Priest for life because of Fr frank Pavone. I magine a Heart Conference ignoring a world renowned Cardiologist in its Backyard who specializes in the Keynote Topic.DR Burke dedicated her life to this topic. Where & when did we get our souls. I know God Our Father in heaven sheds a tear after every abortion.